Diphthongs can be really tricky! 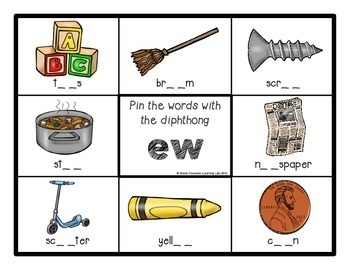 These Pin & Spin cards are perfect for literacy centers to practice diphthong sounds. Each card has three correct answers. The cards are self-checking so the students can work independently! All of the Pin & Spin sets are perfect for centers! 12 individual, double sided (self-checking) full-page Pin & Spin cards for each ending blend listed (aw, au, ew, oy, oi, long oo, short oo, long ow, short ow, ou, ue, ui). The front is in full color and the back is in greyscale to save ink. Check out my series of Pin & Spin products in my Pin and Spin custom category. Topics include beginning letters, money, fractions, parts of speech, multiplication, ABC order, addition, subtraction, CVC words, recycle sorting, and much more! Would you like to read a blog post about Pin & Spin? Check out my blog NicolesLearningLab.blogspot.com to read about how it can work in your classroom! WHAT IS PIN & SPIN? 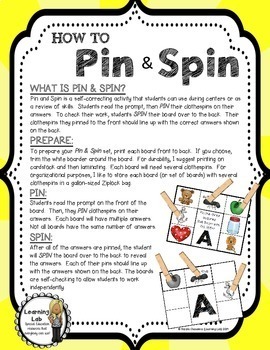 Pin and Spin is a self-correcting activity that students can use during centers or as a review of skills. Students read the prompt, then PIN their clothespins on their answers. To check their work, students SPIN their board over to the back. Their clothespins they pinned to the front should line up with the correct answers shown on the back. To prepare your Pin & Spin set, print each board front to back. If you choose, trim the white boarder around the board. For durability, I suggest printing on cardstock and then laminating. Each board will need several clothespins. For organizational purposes, I like to store each board (or set of boards) with several clothespins in a gallon-sized Ziplock bag. Students read the prompt on the front of the board. Then, they PIN clothespins on their answers. Each board will have multiple answers. Not all boards have the same number of answers. After all of the answers are pinned, the student will SPIN the board over to the back to reveal the answers. Each of their pins should line up with the answers shown on the back. The boards are self-checking to allow students to work independently.